(Bloomberg) -- Low volatility sounds like a good thing in markets. And it can be, unless it’s masking or ignoring problems. The real trick is preparing for an end that can be quick and unpleasant. “Volatility rarely picks up bit by bit. It tends to spike when the late-cycle bullish narrative goes off the rails,” Cantor Fitzgerald LP’s Peter Cecchini wrote in an email. Price swings are exceptionally depressed across assets now, with major central banks displaying relative policy clarity, signs that China’s stimulus is working and global economic growth that appears to be easing instead of falling. The MOVE index of Treasury volatility isn’t far off its March 20 record low, while the JPMorgan Global FX Volatility Index has fallen to levels not seen since 2014. The Cboe Volatility Index, or VIX, reached its lowest point since October on Friday. 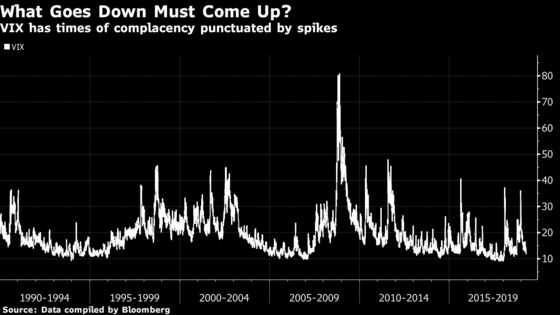 But the likes of Morgan Stanley’s Andrew Sheets and Harley Bassman, inventor of the MOVE index, argue that the calm won’t last. Last February was an example of a move that caught markets by surprise. The VIX stayed unusually low throughout 2017, lulling investors into a false sense of complacency. 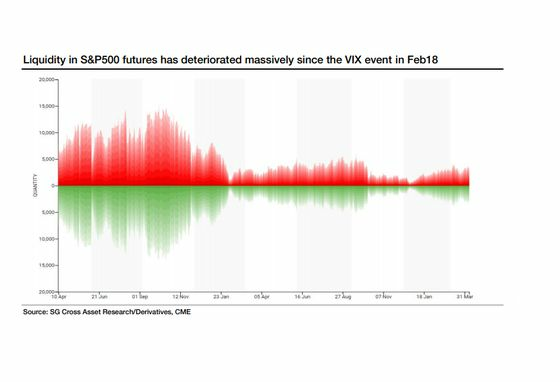 When volatility did pop during a meltdown -- the VIX skyrocketed to close Feb. 5 at 37.32 -- it left some short-volatility products broken beyond repair. Potential triggers for price swings include factors like a worsening of global trade relations, a return to hikes by the Federal Reserve, an economic downturn or a geopolitical shock. Liquidity is also cited as a concern by Sheets, JPMorgan Chase & Co.’s Marko Kolanovic and Societe Generale SA strategists led by Vincent Cassot, who maintain that low liquidity will worsen volatility once signs of trouble start to emerge. Then, there’s the question of what to do about this all-but-certain jump in volatility. “Relative value volatility trades is the way to go, until one side finally capitulates,” the SocGen strategists wrote. They recommend tilting dispersion trades toward technology, consumer discretionary, industrials and utility stocks, as those sectors tend to have outsized increases in volatility during downturns. They also suggest a trade going long British pound/U.S. dollar volatility and short FTSE 100 volatility as the currency is likely to be more affected by the outcome of Brexit. Todd Salamone of Schaeffer’s Investment Research points to the net short position on VIX futures, the largest since 2017, as the biggest current risk for equity bulls. “Euphoria needs to be more widespread before this risk comes into play, but history has taught me to be nearly certain that these speculators will be caught wrong-footed when volatility eventually pops,” Salamone wrote. He recommends using options to manage the risk. There are still plenty of recommendations to continue taking advantage of the current environment. “As long as central bank policy remains accommodative even as growth improves, economic and market volatility should remain low, supporting multiple expansion and further equity gains,” Evercore ISI strategist Dennis Debusschere wrote in a note. Andrew Scott, head of Americas cross-asset strategy at SocGen, agreed. “In the short-run it is going to be very difficult for markets to break out of this low volatility regime,” he said in an email. It will take a major factor like a trade war of geopolitical flare-up “or a dramatic re-pricing of rate and/or global growth expectations in either direction for us to achieve any semblance of volatility persistence,” according to him. But history hints that hoping things will stay calm forever may be a fool’s errand. Morgan Stanley’s Sheets views 2007 as a cautionary tale for anyone who sees the world of low price swings as a time for complacency -- that year you also had a very flat yield curve and low implied volatility.